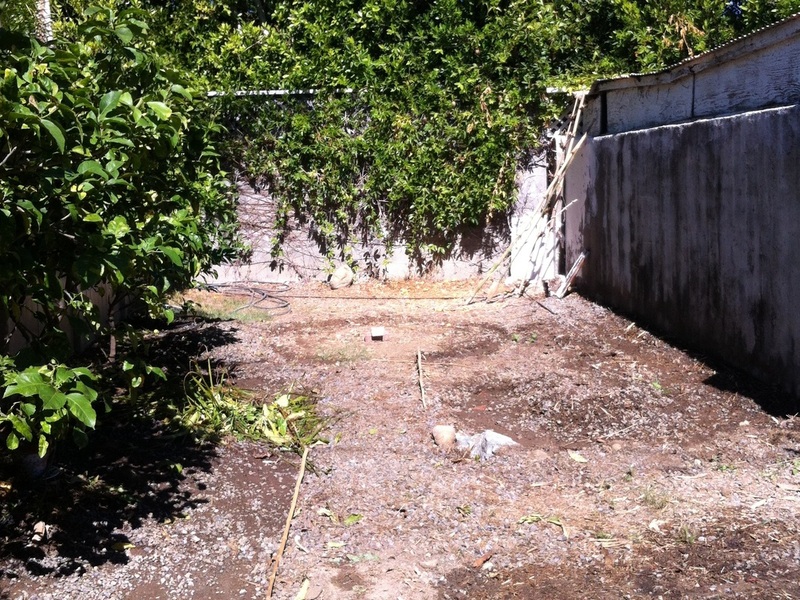 At the back wall (northern end) you can see a passion fruit vine. Along the left side of the photo (west side) you can see the trees (peach, nectarine, and several citrus) that I inherited. The right side (east) is bare, following the removal of some bamboo. The soil, as you can see, was pretty well covered with gravel (and broken glass and rusty nails). The ground has been watered in areas where I planned to dig. The best part is that now I can walk barefoot in the garden, without worrying about stepping on rusty nails or broken glass.The backward "C" shape on the right hand side is a hugelkultur bed. So far I have put in some artichoke plants and clover. And I plan to add a few more things to that area soon. 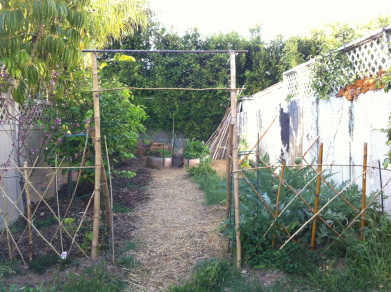 Across the southern end I put a lightweight fence made from miscellaneous remains of garden construction--chicken wire, tomato supports, and a stick of bamboo--just enough to keep the elderly dog who goes off leash in the area from leaving "deposits" for me to find. While I was mulching, I put a layer of straw under the artichoke plants. The rest of the garden is beginning to produce and we are enjoying salads of spinach, lettuce, radish, peas and turnip-yum! Now my focus is shifting toward getting a compost pile going. Time for some trips to the local coffee shops and juice bars! Combining that with the last 2 bales of straw collected in the fall, the spent vegetation from the garden, should yield some decent compost. If you look closely, you can see the new plants at the base of the two main support poles. 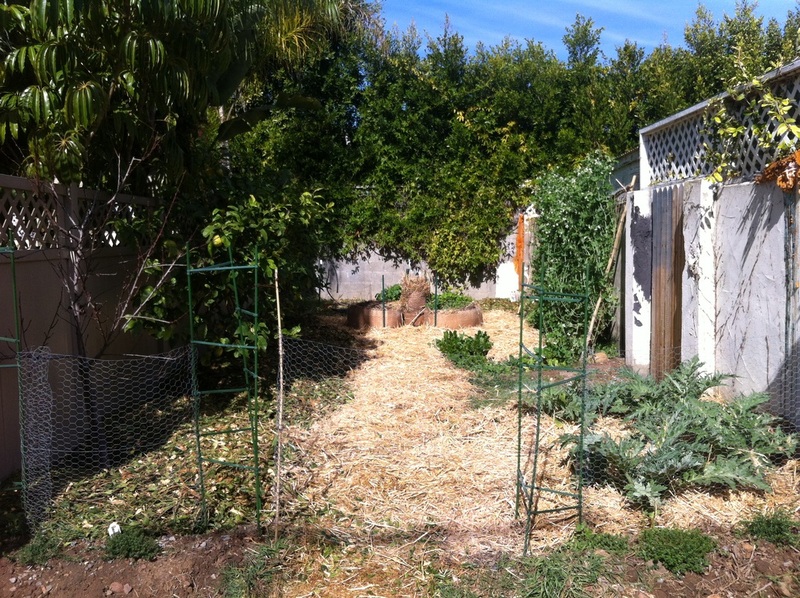 The peas were pretty much spent and succumbing to downy mildew, so I cut the vines and took them out for composting. I was out of town for 2 weeks. While I was gone the kids watered and ate from the garden. When returned the first artichokes were ready and the chard was overflowing. Great job, kids! The contouring by the fruit trees was pretty easy to do, but the digging along the east side was a little more demanding. Near the back I dug out soil in a sort of "J" shape. I dug down a foot or more and replaced the gravel and dirt with imported soil. I do plan to build soil through composting as well, but I was anxious to plant a few things and had my doubts about the fertility of the native soil as it seemed to have relatively little biological activity. the pathways. 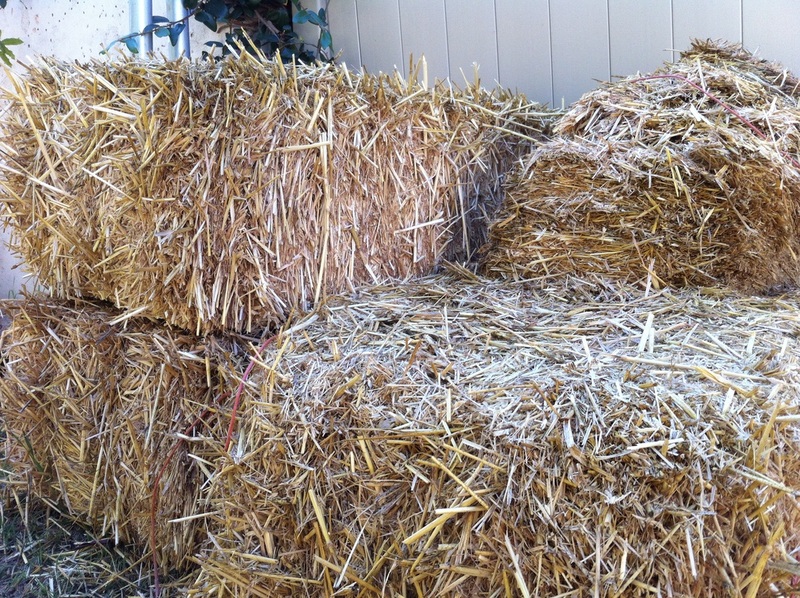 We talked to the "pumpkin patch" guys who sell pumpkins on lots in town, and then showed up the day after Halloween--10 bales of fabulous garden carbon, free for the hauling! I love straw in the garden. It's convenient to move and to store. It's easy to work with, a great source of carbon, and it is basically a bunch of hollow tubes that allow air to move in and through a compost pile or mulched pathway, or wherever you use it. 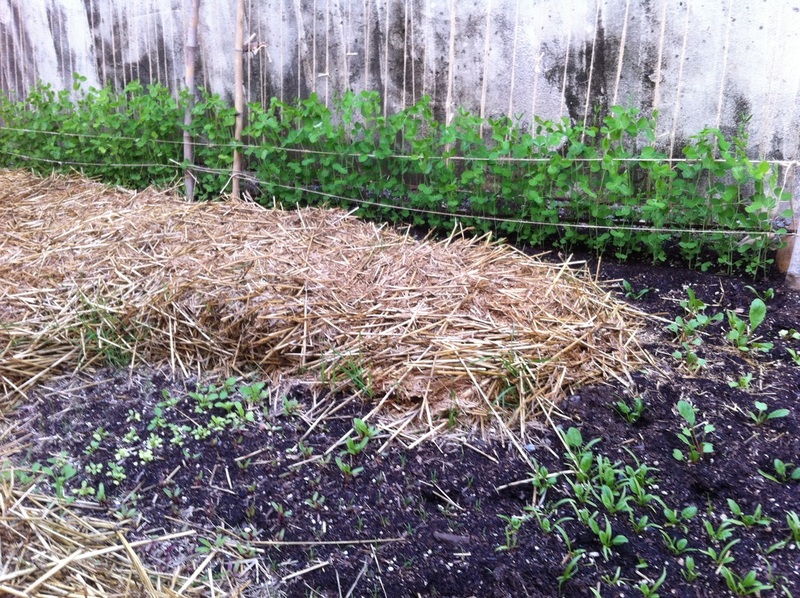 I laid down cardboard and then used straw over it to mulch the pathways and form the base of a straw bale composting keyhole garden bed. One day after a rare rain storm I heard the sound a wood chipper. A neighbor was removing a tree as part of an extensive remodel and it was being chipped on site. The trimmers very kindly agreed to drive down the alley and dump part of the chipped wood and leaves next to my garden. As it enabled them to delay their trip to the dump, they didn't charge me and after a little work with shovel and rake, the mini-orchard had a thick blanket (6 inches or more) to hold in the precious moisture. It's really warming up now and I'm guessing it's time to put the chayote squash in the ground. 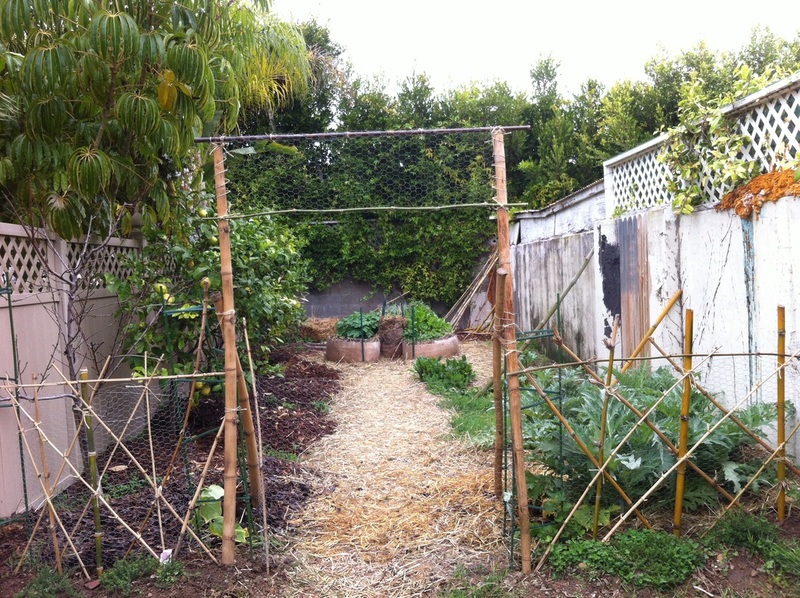 I've never grown them before, but I've been told they vine like crazy and needed a strong support, so I used some bamboo to reinforce the chicken wire fencing across the front of the garden. I bought the chayote fruit in the fall and asked the farmer how to grow them. He told me to put them on the windowsill until they sprouted, then pot them for the the winter and in early spring, put them in the ground. More about the back alley rehab.